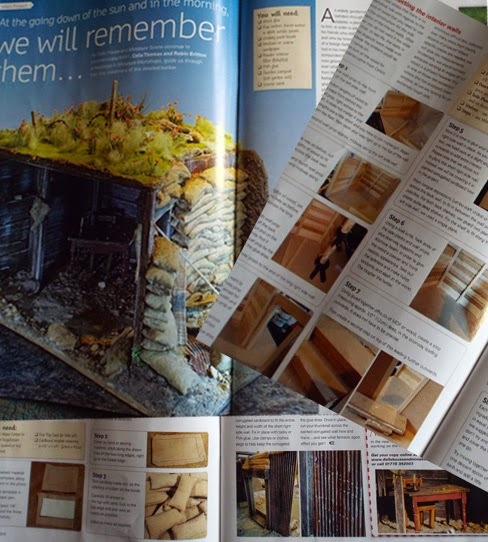 Part One Of Our WW1 Project Can Be Seen In The Latest Issue Of Dolls House & Miniature Scene Magazine! 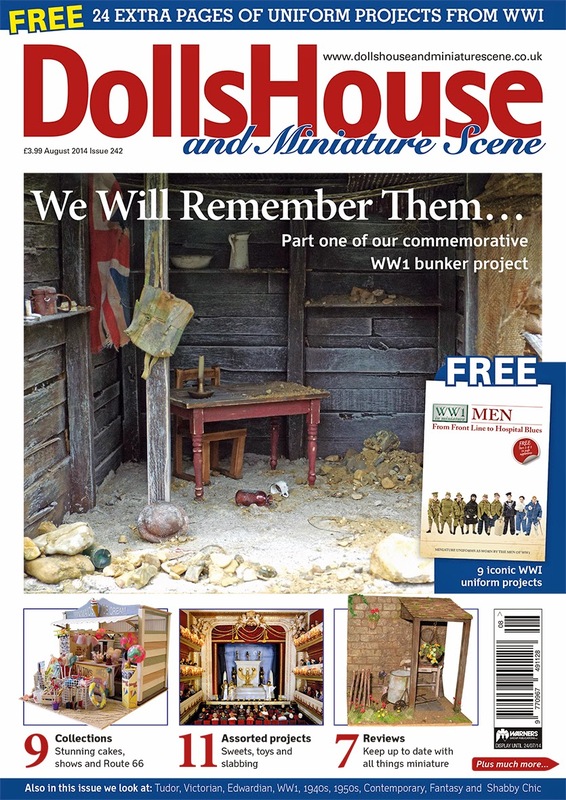 Part One of our WW1 Officer's Dugout, Poppy Field & Trench Scene can now be seen in the August 2014 issue of Dolls House & Miniature Scene Magazine, which is out now in the shops. The first part of this "how to make" feature deals with the construction of the base, including interior walls, floor, sandbags, rusty corrugated metal panels etc. Even if you do not wish to make the whole scene, you may find certain elements of this project interesting, which could be used in a variety of ways. The completed WW1 scene is now on display at Thame Museum (Oxfordshire) as part of a WW1 Centenary Exhibition, until later in August. Please click on the following link for more details. We are also blown away by a wonderful review written by Dolls House & Miniature Scene magazine editor Lucie Roper, on page 74 & 75 of the same issue, who spent a whole day with us at our Spring Workshop back in April of this year. 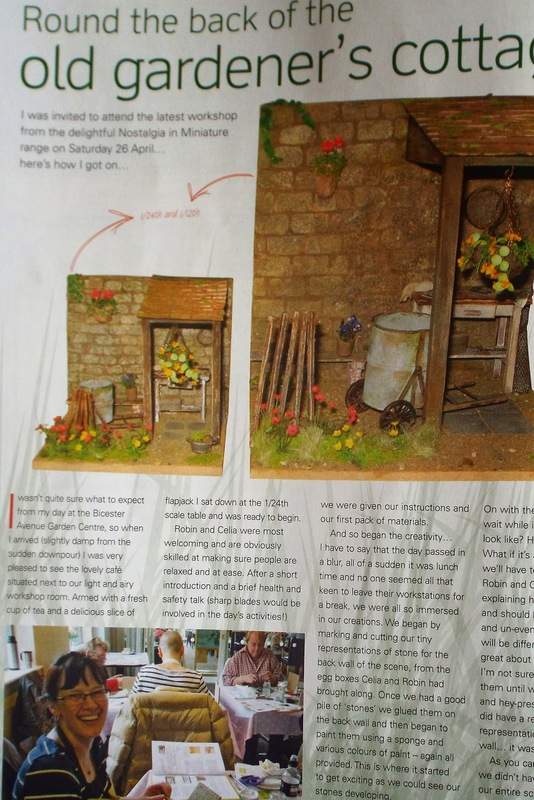 Lucie came and joined in the fun to make our Round The Back Of The Old Gardener's Cottage project.....she did rather well, and you can see Lucie's efforts in the magazine! If you would like to come and join us for another creative fun day at our September Workshop that is taking place at Bicester Avenue Garden Centre (just off Junction 9 of the M40 - Oxfordshire), please do get in touch, as booking is now open. Our Special Group Discount for a group of 4 or more friends/club members is available for this workshop too. 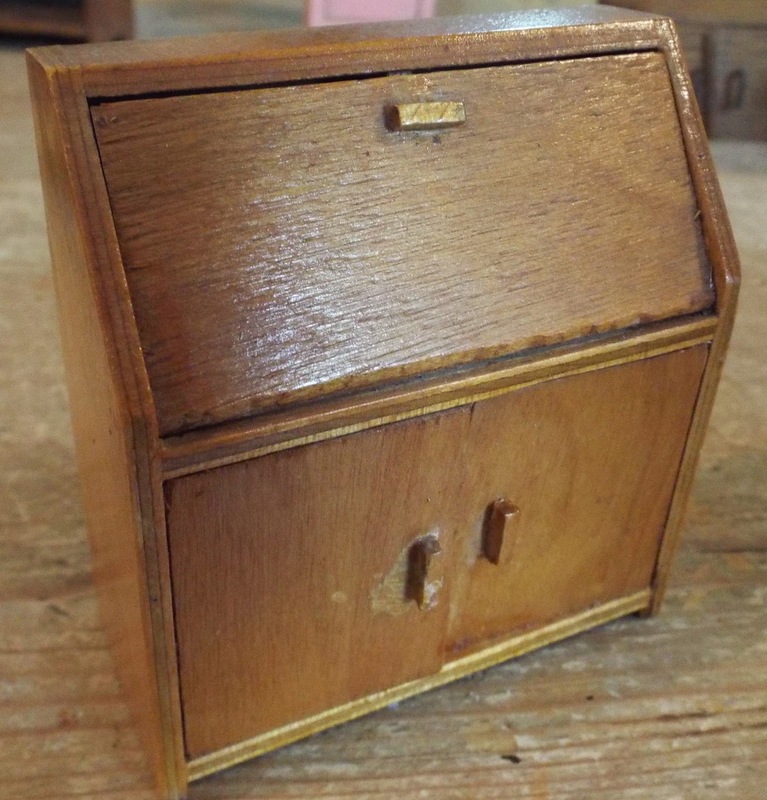 Amongst the various antique and vintage items listed today was this little old miniature potty for your dolls house......it just makes me smile! And then you will understand the significance of that big eye! 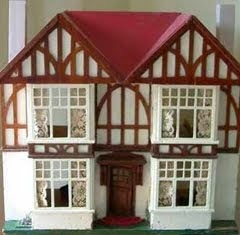 Old Greenacres Dolls House Soon To Be In An Exhibition...Plus An Amazing Very Tiny Tri-ang Inspired Dolls House...Must See! 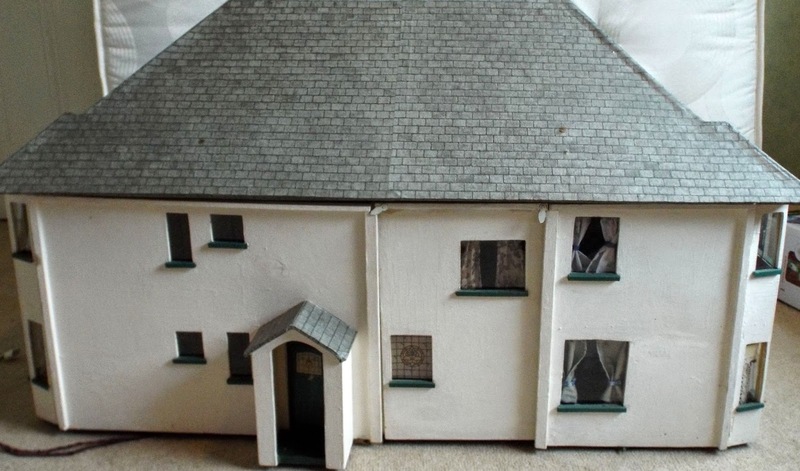 Remember that very big and unusual old doll house called " Greenacres" sold last December on KT Miniatures? 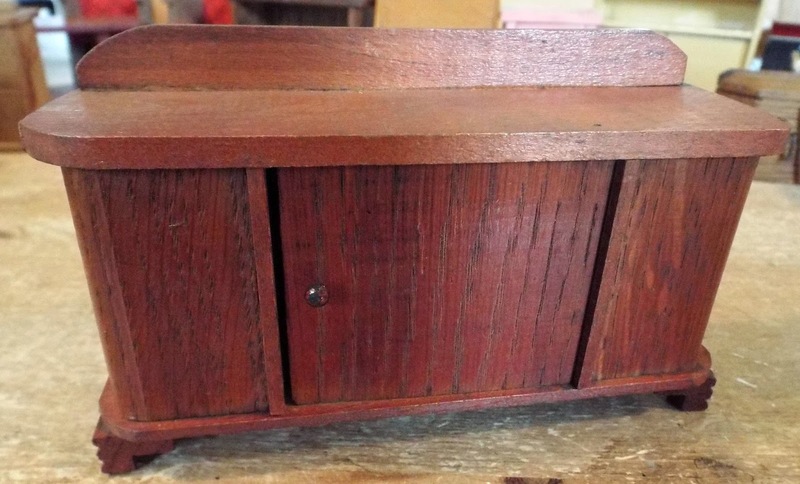 It was huge and with no definitive knowledge from the previous owner of its origin, I'd felt that it had probably been scratch built around the latter part of the 20th century. It had a real labyrinth of rooms, was in need of some real TLC, and to be honest, due to its size had resigned myself to that fact that this particular house would take a while to sell. 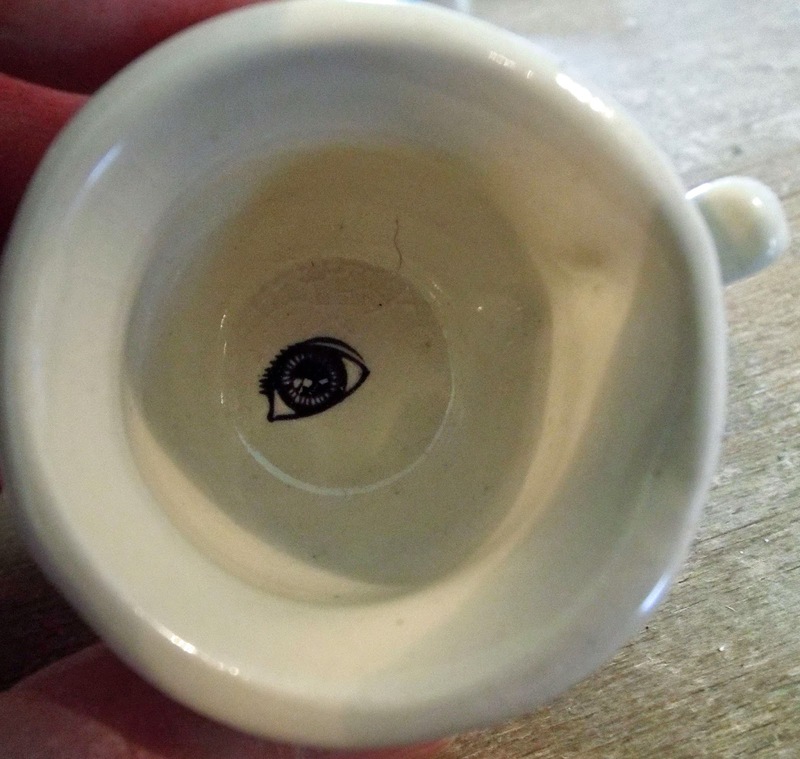 But to my amazement the size made it more attractive to KT Miniatures customer - artist Veronica Tonge, who snapped it up pretty quick.Veronica was thrilled with it and felt it was absolutely perfect for her work. She has lovingly restored it and I understand that from the whacky old wiring plus one or two other aspects, the general consensus now is that it probably did originate a decade or so earlier than first thought ie. from the 1950s. But it has obviously had some considerable "modernisation" along the way. This has made it even more fascinating for Veronica. 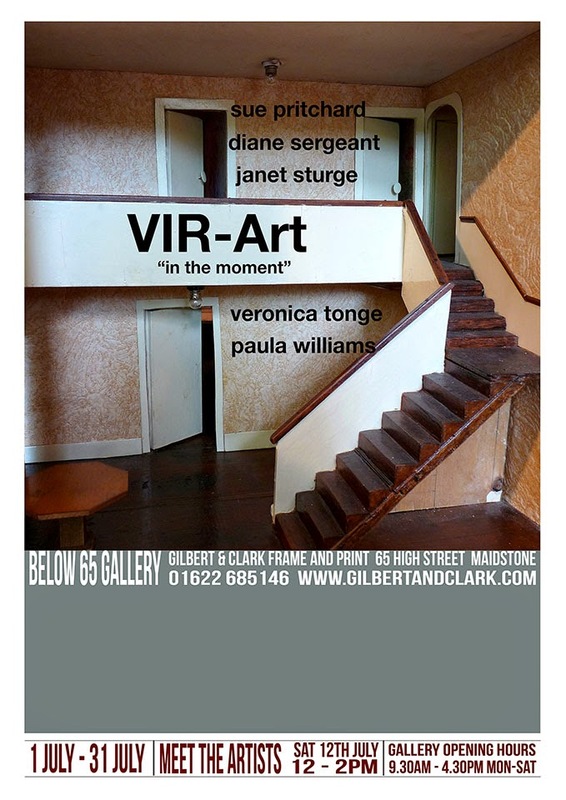 And now....it can be seen in all its glory at a wonderful exhibition in Maidstone....please see the promotional poster below along with Veronica's official label text for the dolls house.....I recognise that stairwell in the photo! A comment on the social and personal expectations of women before the ‘sixties revolution, when all our lives changed and ‘do your own thing’ became the concept to live by. 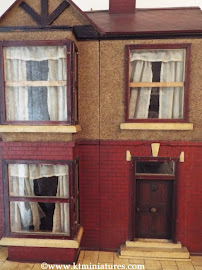 My installation is set in a 1950s doll’s house called Greenacres, which was modified by one of its previous owners to incorporate some Victorian décor. Interestingly, the 20th Century was still operating under many 19th Century restrictive values, but during the Swinging ‘Sixties “Victoriana” became as popular and exciting for young people as “Vintage” is now. The past can always be glamourised! Suggesting and exploring memories of the domestic and social restrictions of over half a century ago is to revisit a vanished world, which I have symbolised by blocks of gossip and text reflecting real issues. Sounds absolutely fascinating and I for one am planning on making my way over to Maidstone in Kent at some point in July to take a peek. Full address, details etc. can be found on the Gallery website - address is on the above poster. 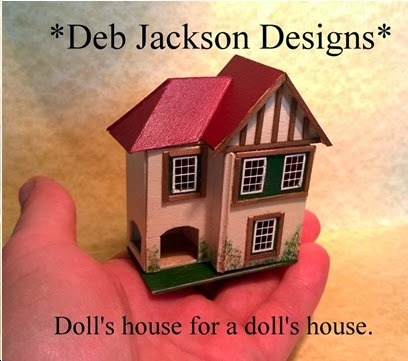 Remember a recent posting on here about an old friend of mine, Deb Jackson and her wonderful weeny dolls houses? 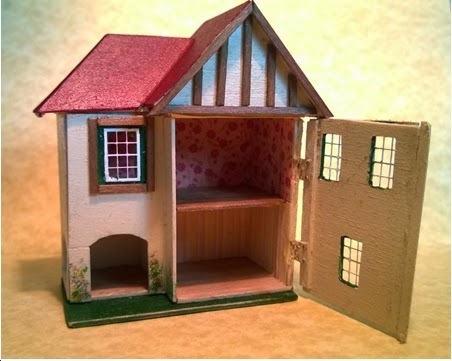 Well....having been so blown away at seeing her latest brand new beautiful tiny creations at the Kensington Dolls House Festival, suggested to Deb about having a go at a possible Tri-ang type of dolls house.....and blimey, she didn't waste any time! These images landed in my inbox this week with the brilliant news that Deb was about to list it on Ebay and wanted to know what I thought about it....haha, what a question! Well, what could I say...other than of course it is absolutely STUNNING & AMAZING! It is not meant to be an exact copy of a Tri-ang but Deb describes it as "Tri-ang inspired" which sums it up perfectly. 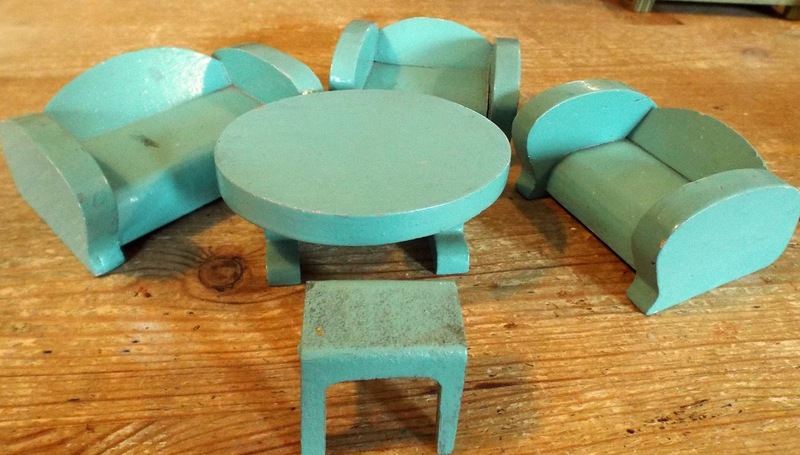 The overall vintage patina has been captured perfectly and even the inside decor is beautiful....if you are a collector of vintage dolls houses and looking for an "old dolls house" to put inside your old dolls house.....then look no further, this is "must have"! UPDATE! 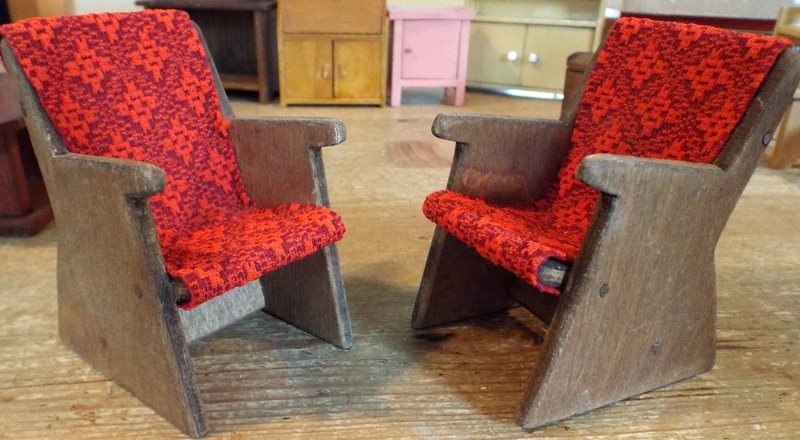 Deb has just told me that she has made some little furniture to go inside the house too....also up for sale on Ebay....Fantastic! 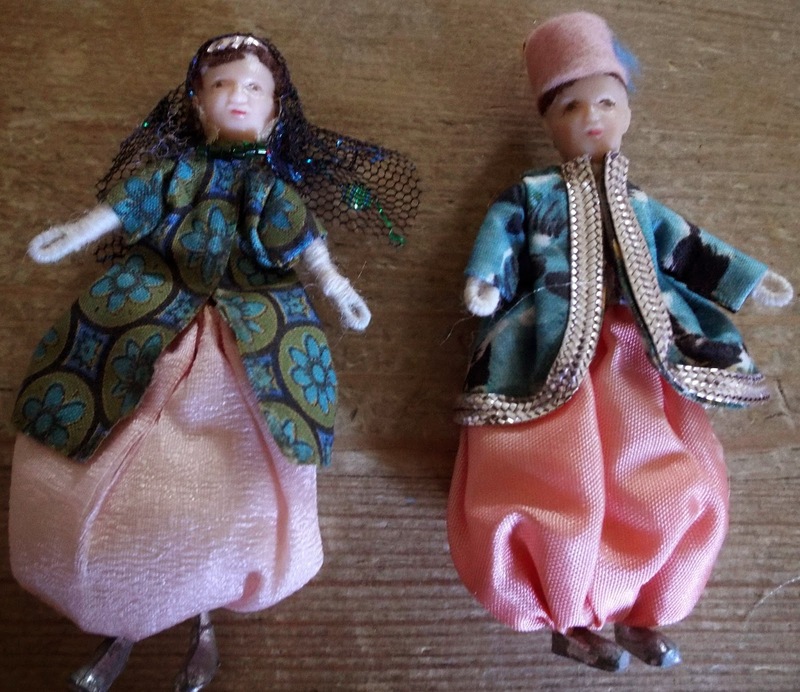 Even More Unusual Dol-Toi Dolls! 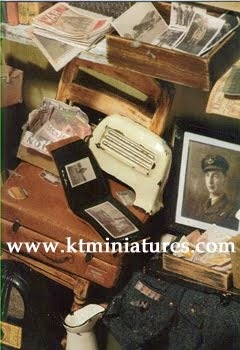 Yesterday, the remaining Dol-Toi dolls belonging to Marion Osborne, were put up for sale on KT Miniatures website. 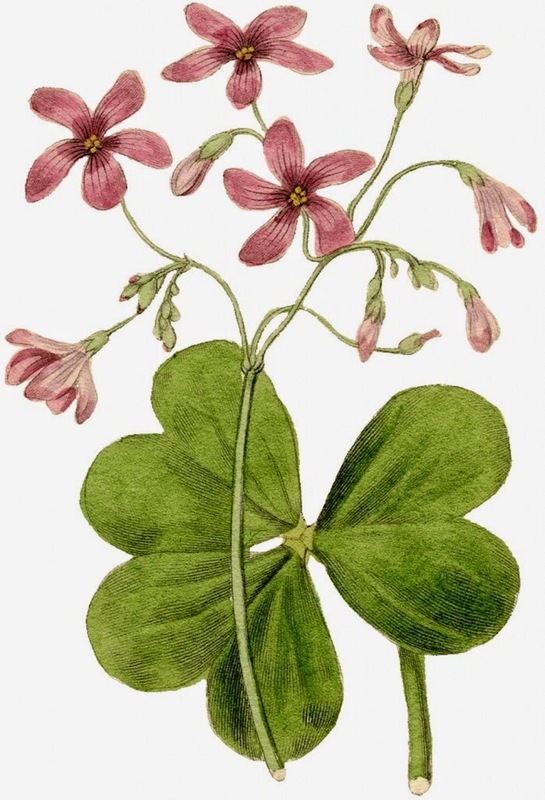 Most are quite unusual and the majority of them are from the Dol-Toi Children Of All Nations range. Luckily I have Marion's Book Of Dol-Toi and accompanying disk of photos to instruct me on exactly which doll is which....as to be honest some of the costuming is quite obscure and so whacky that I initially had a little difficulty guessing which country they were supposed to represent...but it has been utterly delightful and great fun seeing these close up! I shall highlight a few of the more interesting ones on here. 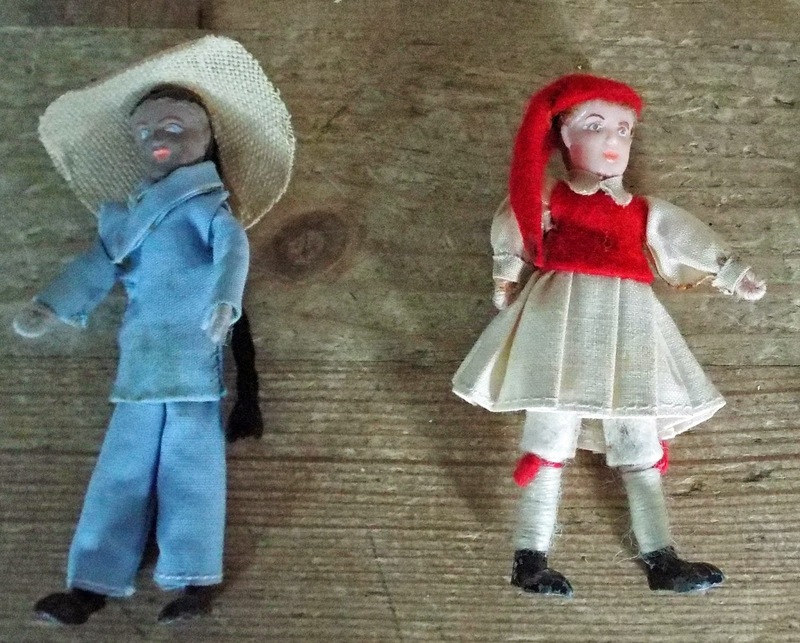 All those listed yesterday are the plastic head dolls, with wired frames and lead feet. 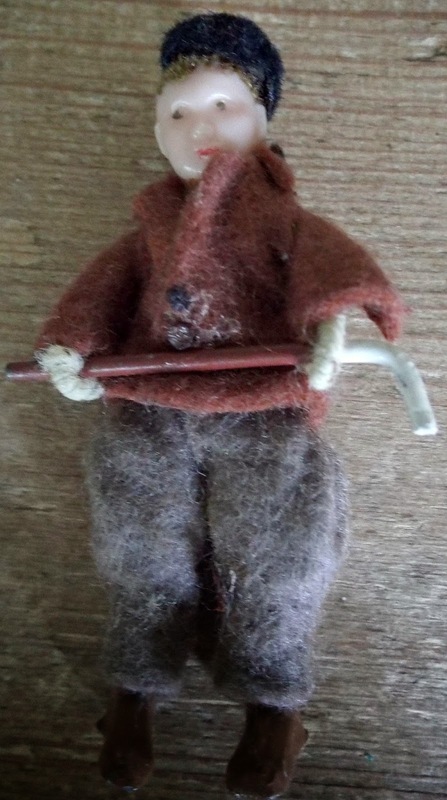 Three of the dolls newly listed yesterday are not part of the Children Of All Nations range.... the first being this little boy all dressed up in his riding gear, complete with whip! I have never handled a Dol-Toi doll dressed in riding gear before so I think we can say that it doesn't come along very often. The inside leg seams of his trousers need sticking back together plus jacket arm seams too but is not a problem, just needs a dash of glue. To be honest, this is such a common problem with these Dol-Toi dolls clothes plus you will find on some of the dolls, the old glue has left brown marks on the material too. I have to admit, I have never set eyes on a Dol-Toi maid doll before either and didn't know there were Dol-Toi maid dolls....basically her dress is brown felt, the apron, cuffs and hat are lace. When I saw this doll, I assumed he was a Cossack or something but nope, on checking with Marion's book, turns out he is Mr Noah. (Haha...once I knew who he was supposed to be, it seemed so obvious really). He would have come with Mrs Noah and an ark full of animals....but sadly, we just have Mr Noah himself. Not sure how he could fit into a dolls house but am sure with a bit of imagination he could! 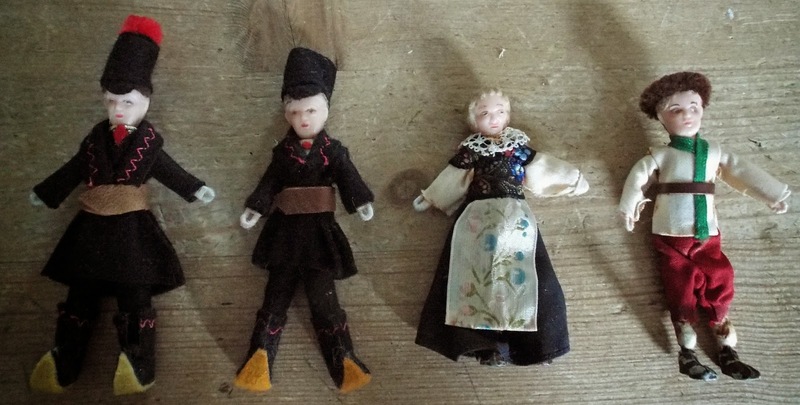 The two dolls on the far right of this photo are believed to be in Russian costume - but quite what the two on the left of the photo are meant to be remains a mystery - even to Marion....I am assuming they are in some sort of ceremonial military uniform perhaps? It has been suggested that these too may be Russian? Quite a lot of detail has gone into their costume. 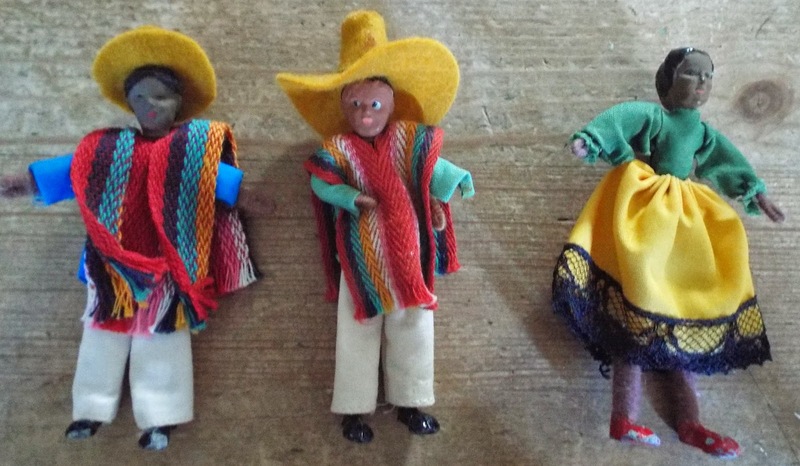 as the one on the far left has its original Dol-Toi label which says "Mexican Boy". Interestingly the two boys have different sized hats....the middle boy's hat is much bigger. 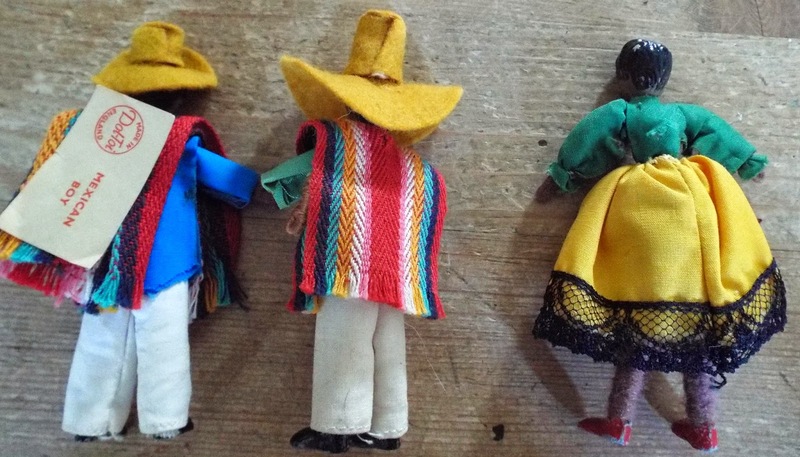 The colours of these Mexican dolls are so bright and vibrant, they are just delightful. I'm quite fond of these two....they are the little Dutch girl and boy. And then there is this Chinese doll on the left and Greek boy on the right. 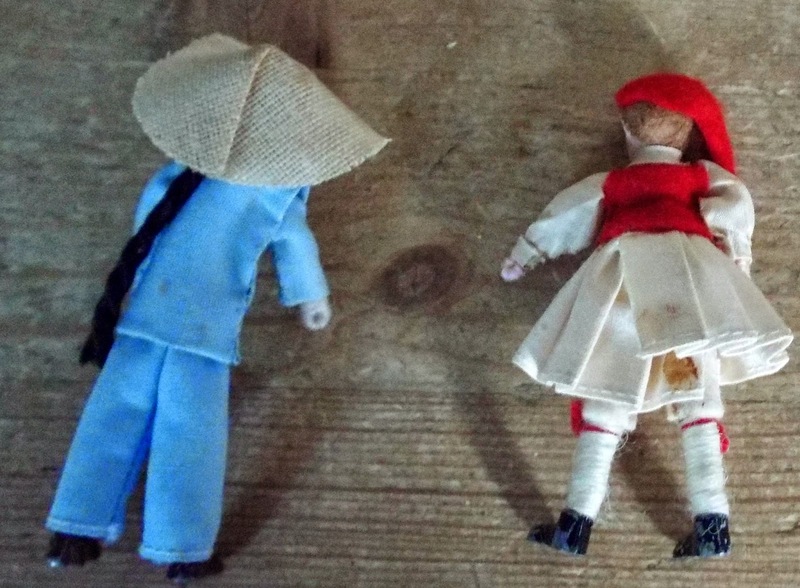 The chinese doll has a very long pigtail that extends right down the back. Just check out that Greek lad's costume....fantastic! The little Scottish boy has lost his hat but still has his white fluffy sporran. 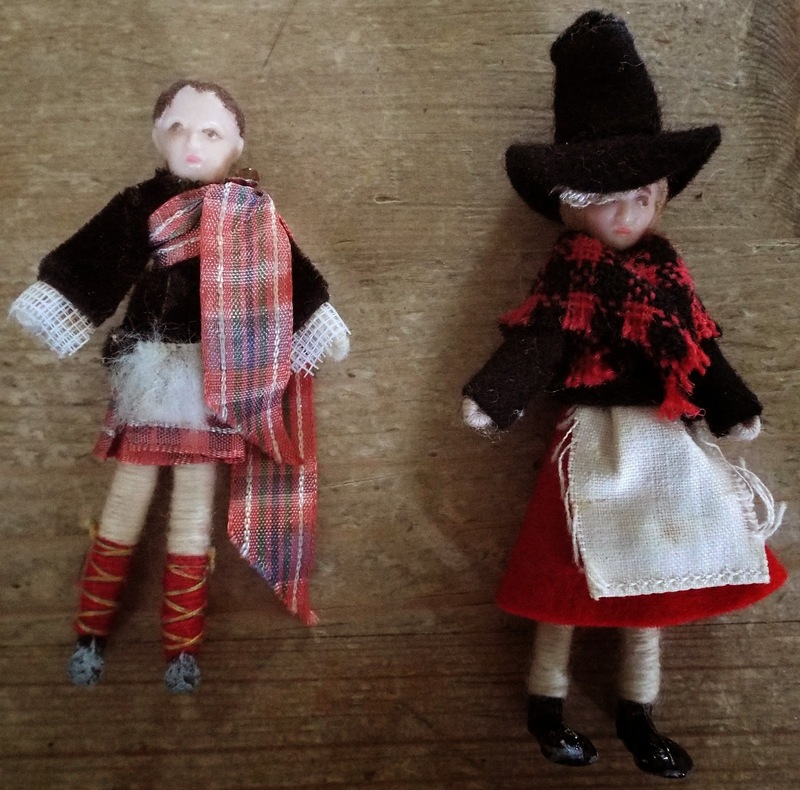 The doll on the right is very obviously in Welsh costume.....her apron is fraying around the edges a little but other than that, is in great condition. 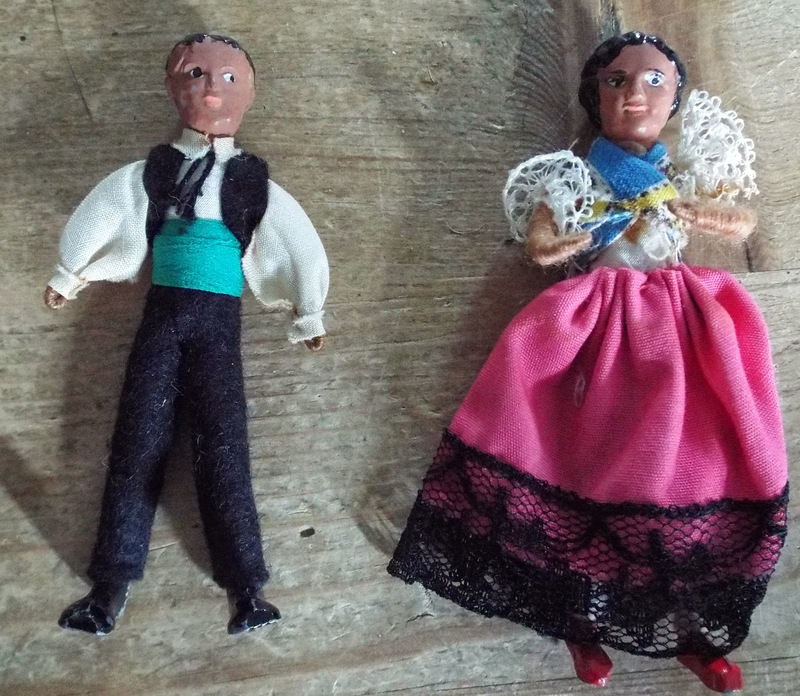 Here is the Spanish boy and girl. 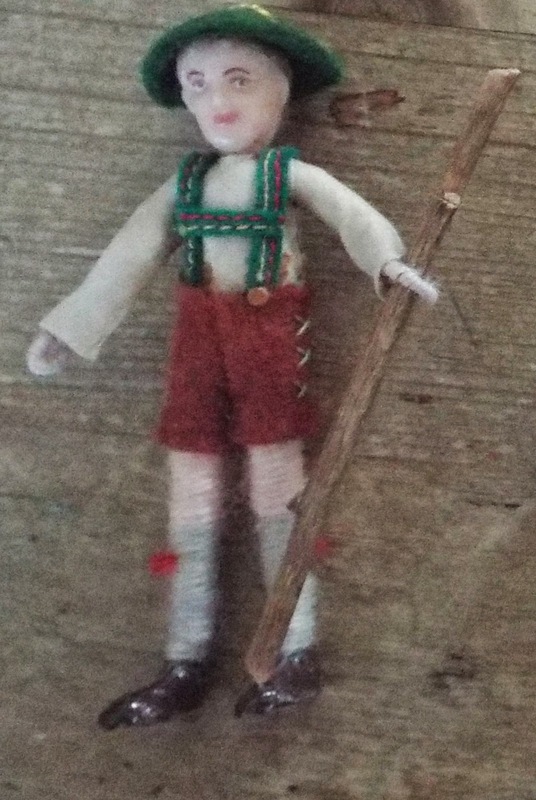 My real favourite is this delightful Tyrolean boy in his lederhosen, which is embellished in some nice embroidered detail. His hat even has feathers and he is holding a stick. And finally there is this Persian boy and girl dressed quite similar in style, their costume is actually quite attractive. The boy even has a tassle on his fez hat. 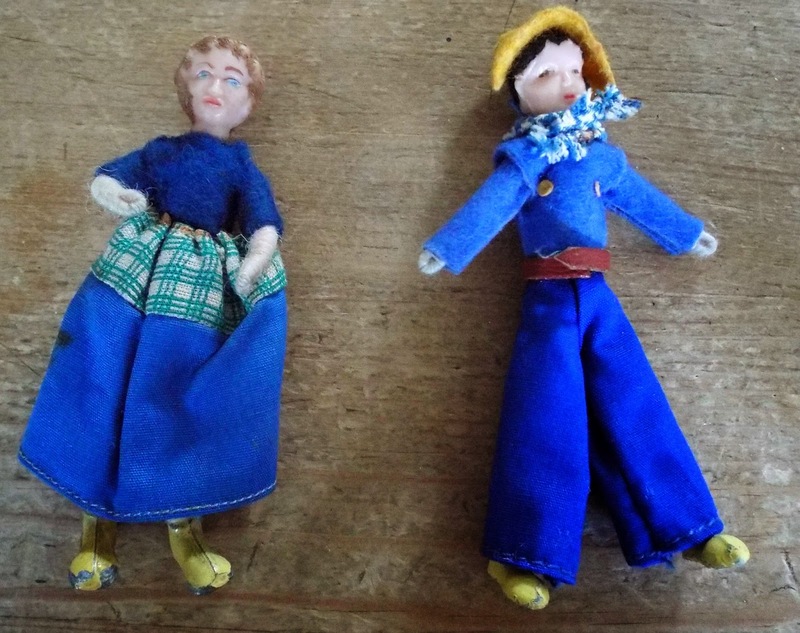 Admittedly some of these dolls from this Children Of All Nations range might perhaps look a little out of place in your normal vintage dolls house but they give you great scope to be imaginative in displaying them. 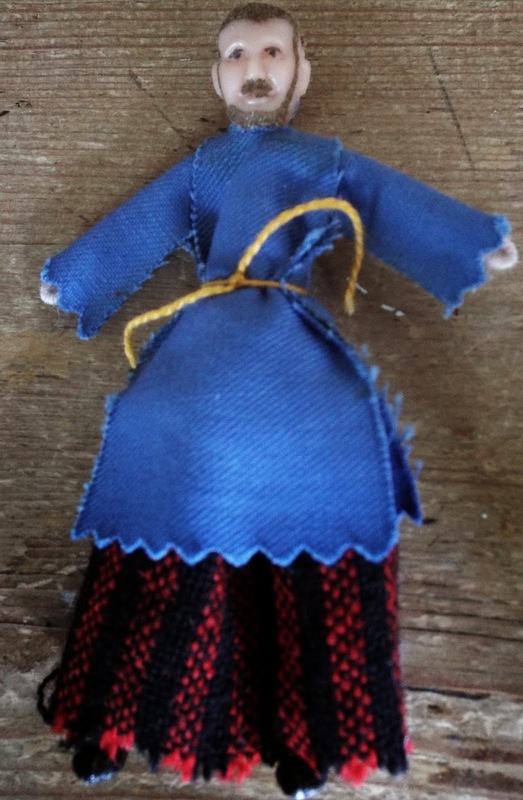 Maybe you could place a whole number of these dolls in a deep picture frame, as shown in a recent blog - CLICK HERE. 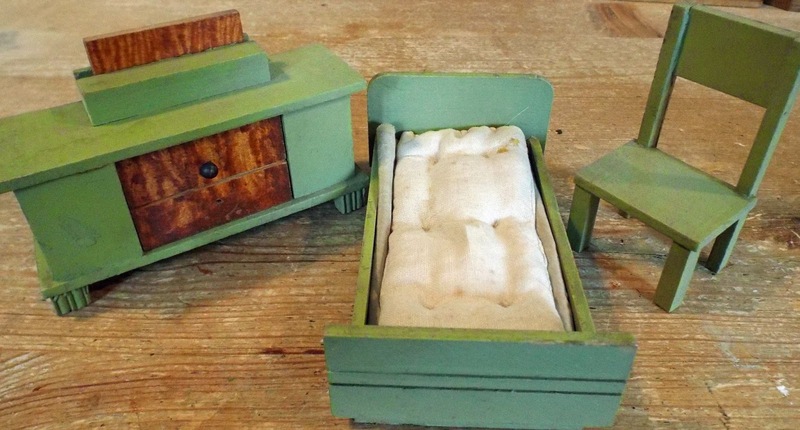 Or maybe create a special room box for them, or actually they could just be distant cousins of your existing dolls house residents...haha! 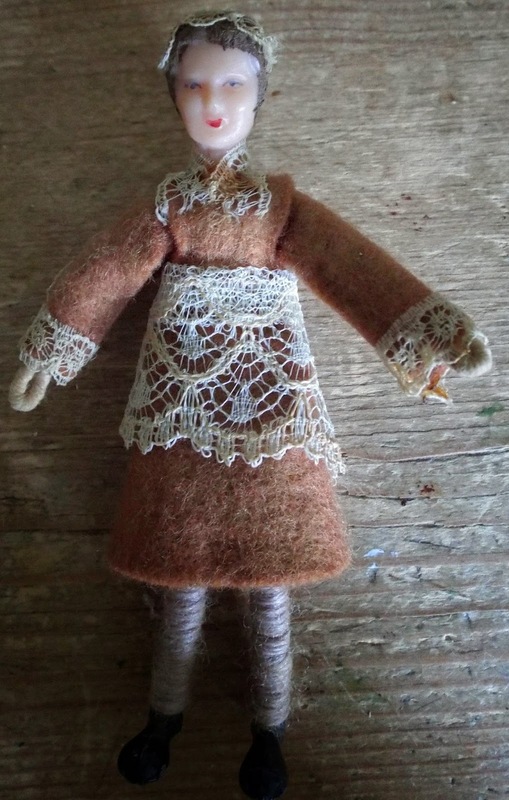 Please do go take a peek at all the other Dol-Toi, Figertoi and Tomac dolls within Marion's Collection that are still for sale, there are some very unusual dolls amongst them. 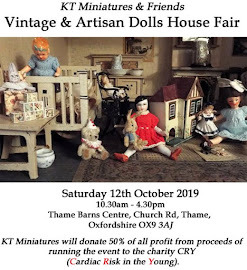 In the past 24 hours I have been busy listing various antique and vintage dolls house furniture to KT Miniatures website. There is a real varied selection. 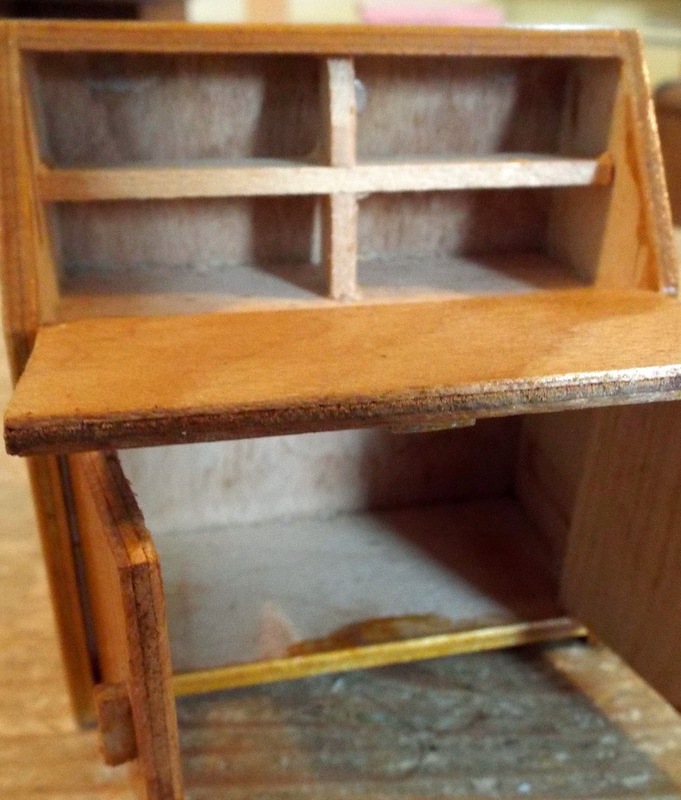 ....to a vintage bureau, German 1930s sideboard & various chairs. 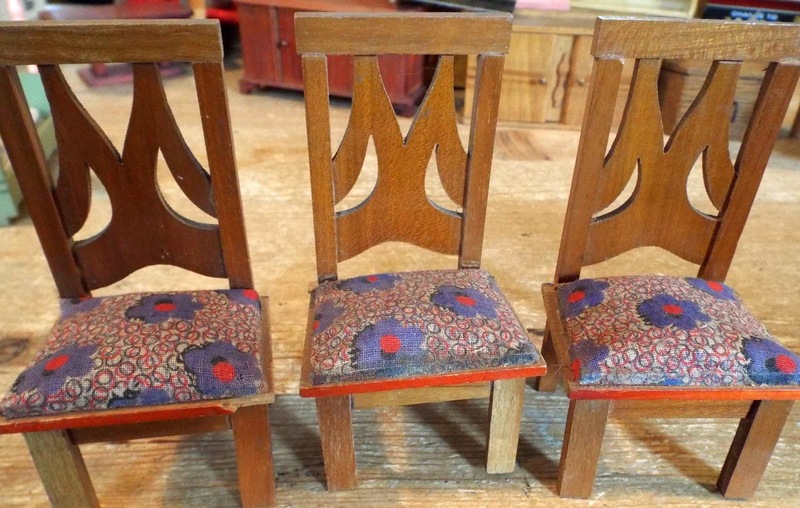 Antique & Vintage Living & Dining Room Page. 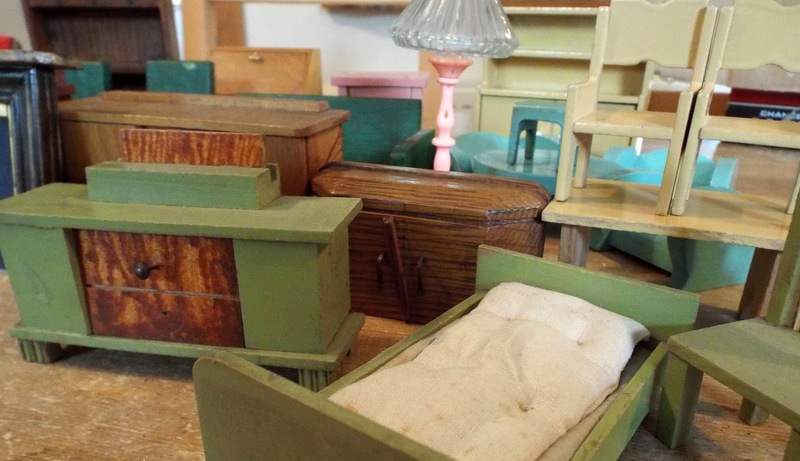 This sweet little German bedroom set can be found on the Antique & Vintage Bedroom Page. It is a lovely shade of pale green and the central veneered fronted draw section lifts right out of the chest of drawers. 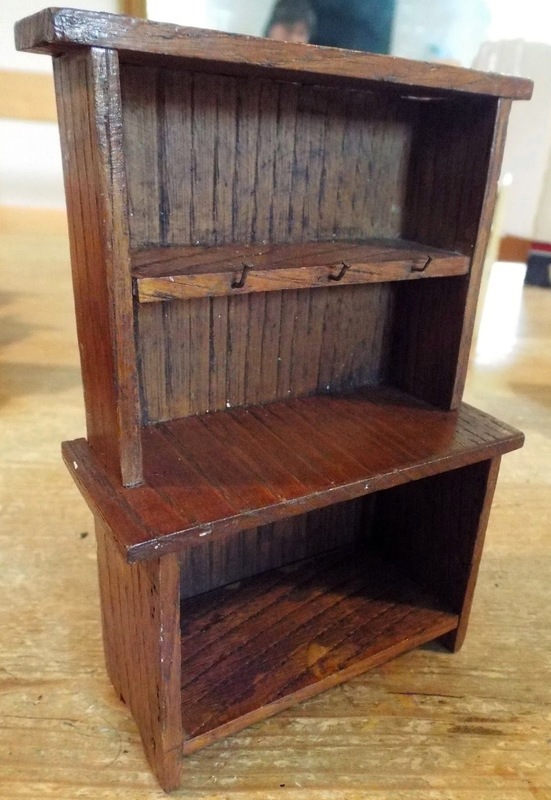 This lovely very old wooden dresser with hooks for hanging your teeny cups etc. 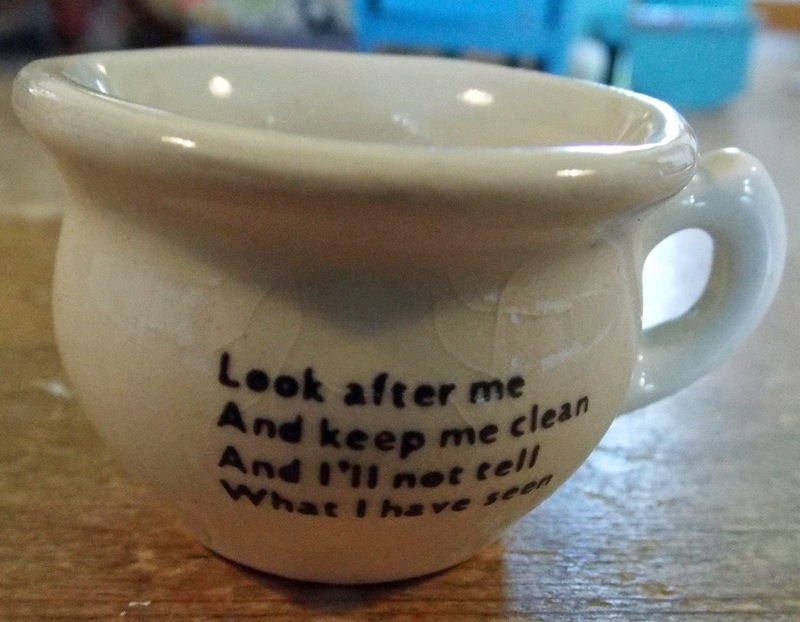 can now be found on the Antique & Vintage Kitchen Page.